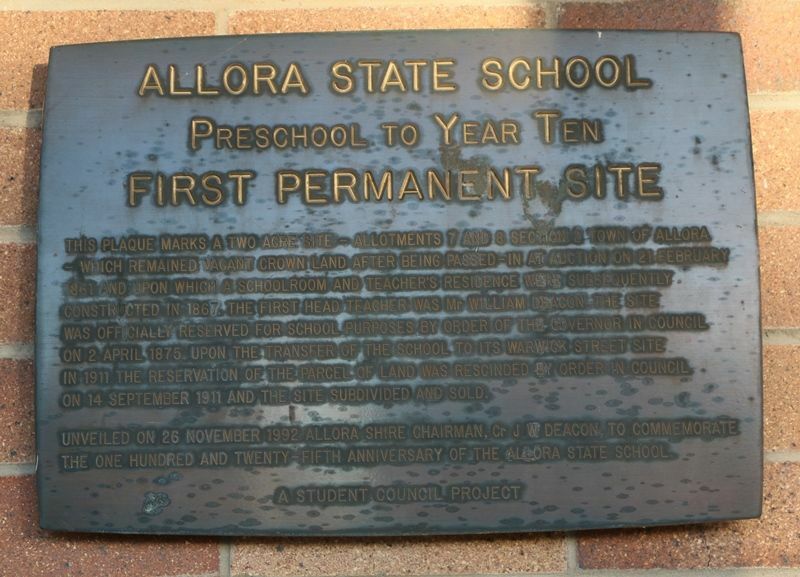 A plaque commemorates the 125th anniversary of the Allora State School. This plaque marks a two acre site - allotments 7 and 8 Section 2 Town of Allora - which remained vacant Crown land after being passed-in at auction on 21 February 1861 and upon which a schoolroom and teacher`s residence were subsequently constructed in 1867. The first head teacher was Mr William Deacon. The site was officially reserved for school purposes by order of the Governor in Council on 2 April 1875. Upon the transfer of the school to its Warwick Street site in 1911 the reservation of the parcel of land was rescinded by Order in Council on 14 September 1911 and the site subdivided and sold. Unveiled on 26 November 1992 Allora Shire Chairman, Cr J W Deacon to commemorate the one hundred and twenty-fifth anniversary of the Allora State School.